Baripada:7/12/18: The Biju Janata Dal (BJD) consolidated its position further in Odisha’s Mayurbhanj as its candidate emerged victorious in the Bijatala zilla parishad by-poll, result of which was declared today. The by-election was held yesterday for zone-32. Of 23,119 voters of the five panchayats –Bijatala, Mundathakura, Banakati, Raihari and Luhasila — 17, 779 voters turned up to exercise their franchise. 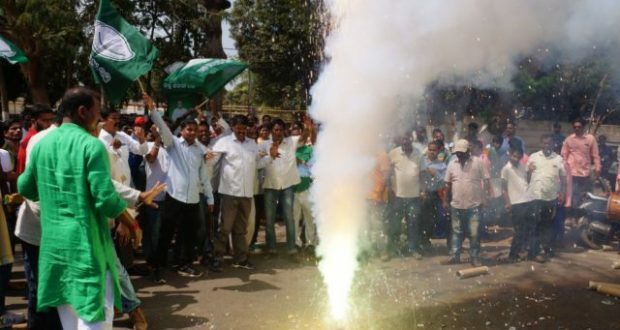 While as many as 10 candidates were in fray, BJD’s Raghunath Majhi polled the maximum votes defeating his nearest rival Kutulu Hansdah from BJP by a margin of 4122 votes. By the end of 19th round of counting, BJD candidate polled 8875 votes followed by BJP (4663) and JMM (2768). The BJD nominee won with a margin of 4212 votes. The Congress, however, failed to woo voters as it hardly managed to garner 176 votes by the end of 19th round of counting. As many as 576 votes were rejected while counting as they were found invalid. The counting began at 7 am at Bijatala block office and continued till 2 pm. The election was necessitated after the demise of BJP supported candidate Chhotray Marandi earlier this January. On the other hand, BJP leader Pitambar Acharya had yesterday alleged vote rigging in eight booths, which was denied by the State Election Commissioner (SEC).